Derby County have moved up int second place in the Championship, for a small while at least, after a good performance and a 1-2 win. Derby County's goals were all scored by on-loan striker Sam Winnall. 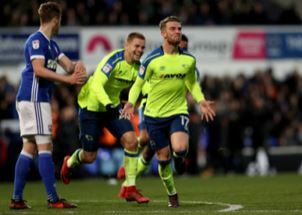 The Sheffield Wednesday loanee was placed into the side in front of David Nugent and rewarded Gary Rowett's faith with a goal in the 13th minute. The Rams took a firmer hand on the game just after half time and it was that man again Winnall who struck to make it 2-0 in the 48th minute. Ipswich refused to lay down and were rewarded with a goal by Joe Garner in the 65th minute but it was the Rams who held on to record their 14th victory of the season and their 6th win away from home. Derby must now wait on the late game where Wolverhampton Wanderers play third place Bristol City. A victory for the home side or a draw will see the Rams retain their second place spot and go int 2018 in an automatic promotion place.